Time to sit back relax, enjoy this first class experience. Lets take a flight! 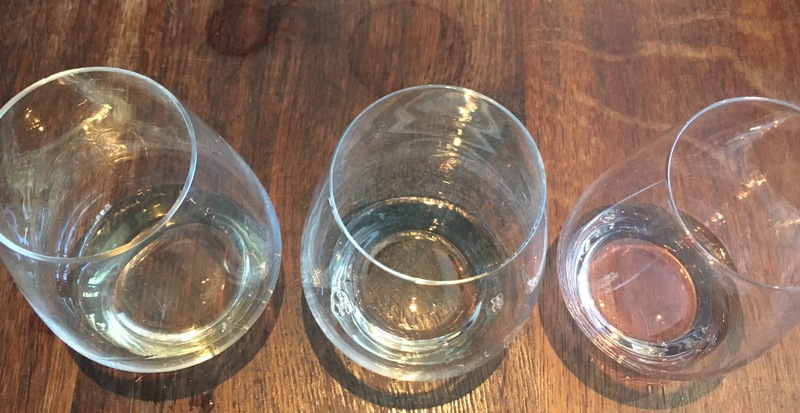 How about a degustation experience combined with a sake flight. 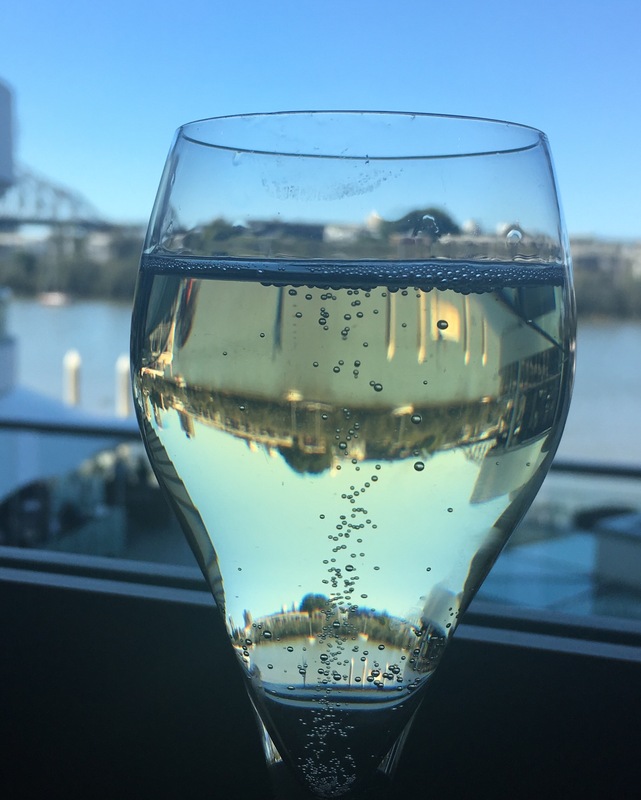 To experience the Japanese menu with service that went above and beyond, whilst seated in a beautiful expansive restaurant overlooking Eagle Street Pier and Brisbane River, is not only heartwarming, but extremely memorable. Sake anyone? 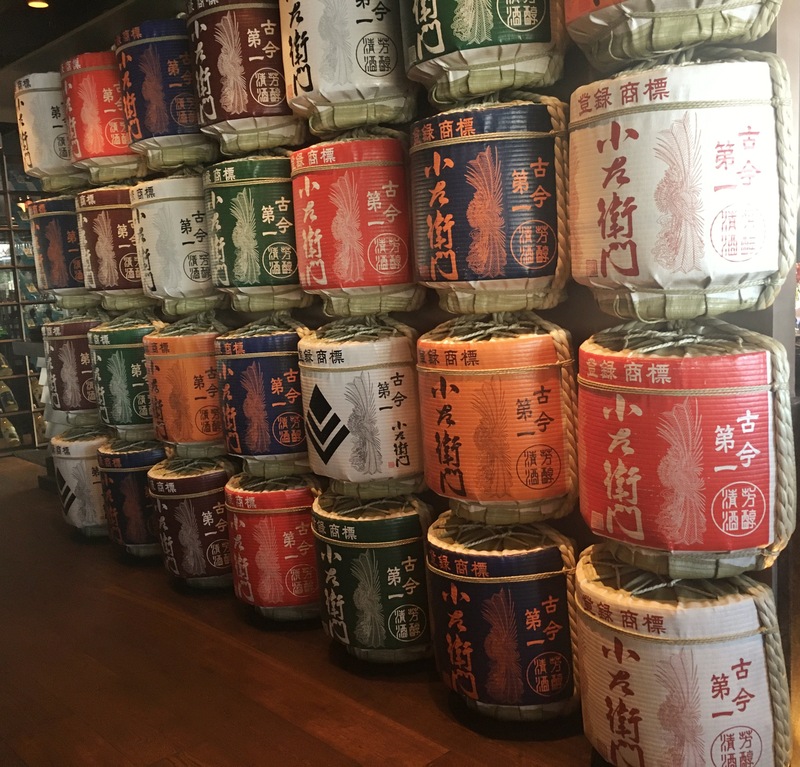 This incredible wall of sake kegs is awe inspiring. Are there really this many sakes? Well lets take a flight and trial some these babies. Three sakes start on the right with a lighter sweeter style sake, then work your way down. The ever attentive staff even suggest to you which sake goes with which meal or dish. Take your time with this, it may look small doses, but sake packs a heafty punch. Today was a special birthday treat. To be fair I wasn’t entirely sure of the menu so left that choice to my birthday treat host. What better way to experience the delights on offer, than with a set menu. Now normally you need a few people at your table for any restaurant to offer you the opportunity of a set menu, this menu though, only two. Chefs New Classic Set Menu that was today’s choice. What a great way to trial a number of dishes on the menu in one go! 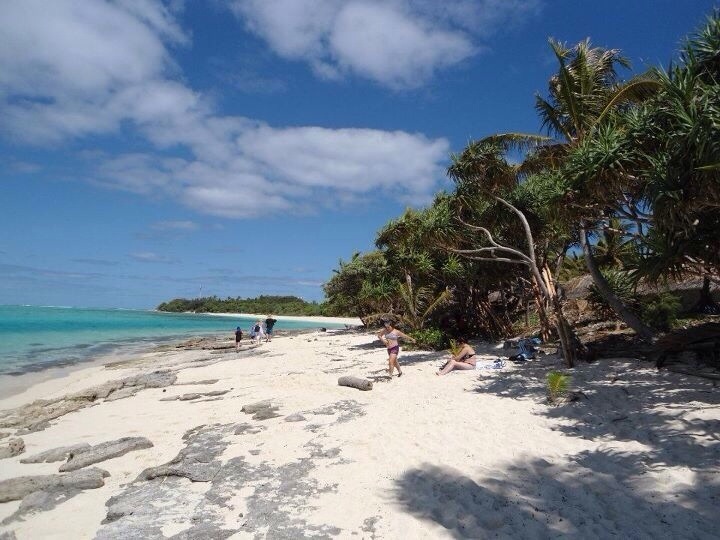 So relax, let those taste buds salivate as we take a flight through the menu. First up, Norri crisps. Delightful crispy seaweed, pairing fantastically with that little soft touch of tuna and seasame on top. Devine. 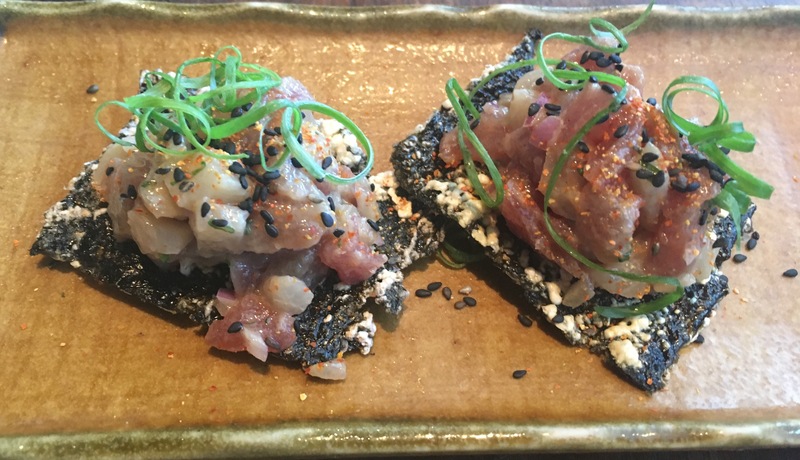 With fabulous, yet simplistic presentation, Hiramasa Kingfish drizzled with housemad lime & jalapeño kosho, followed. The Kingfish had been replaced with another fish, as there not was enough stock on this particular day. However, this dish was soft, delectable and enjoyable. Now I hear a few of you, going hmm not much. But, this to me is the epitome of a degustation style meal. A wonderful opportunity to experience flavours, understanding what you eat and quite simply savouring for enjoyment. Grass fed Beef tatakai. Staff were right, this one matched perfectly with one of the Sakes! With a little bit of crunch, mixed with a light salad type topping, this rare beef was an absolute treat. 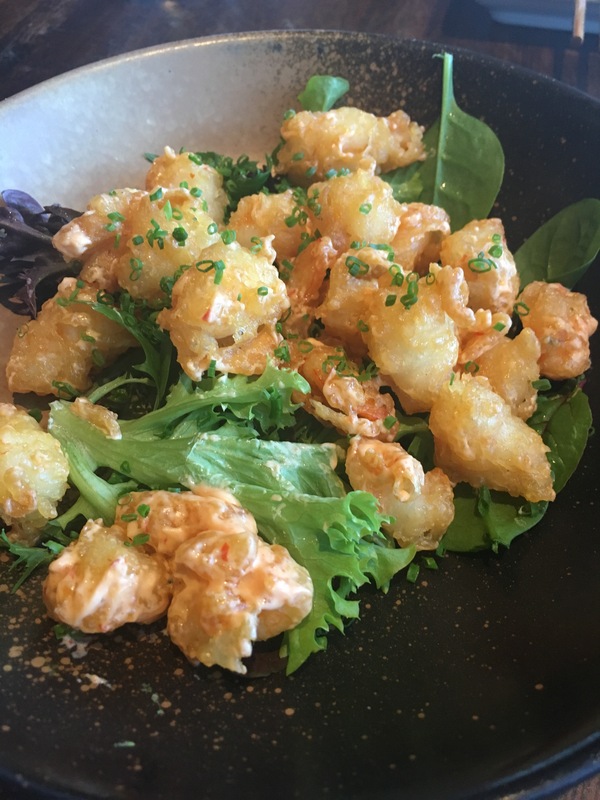 Coated in an incredibly light batter and even lighter mayonnaise, thevpopcorn shrimp dish was superb to say the least. 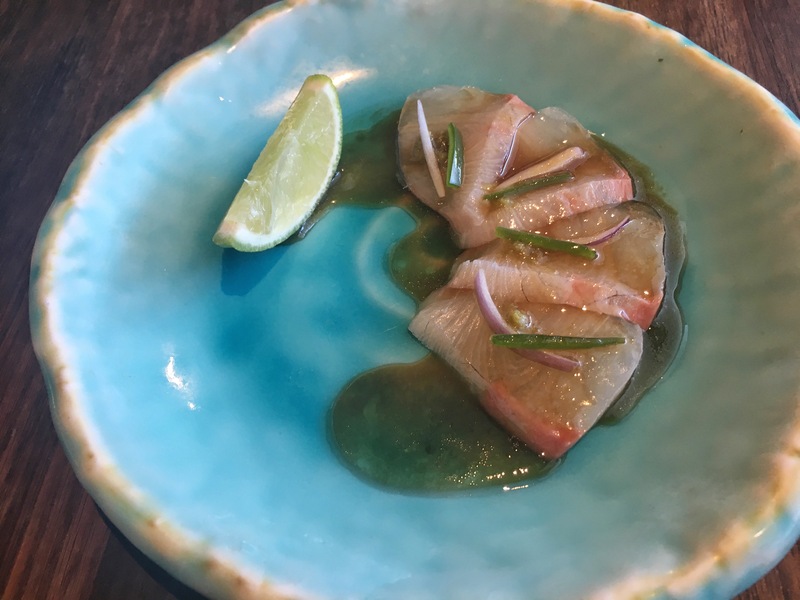 Totally different to the previous dishes, it was an enlivening dish, which woke not only only your tastebuds, but your whole being with the simple flavours and the pop of shrimp. And the dishes kept on coming. Next up this fabulously presented Bass Grouper. Yum! 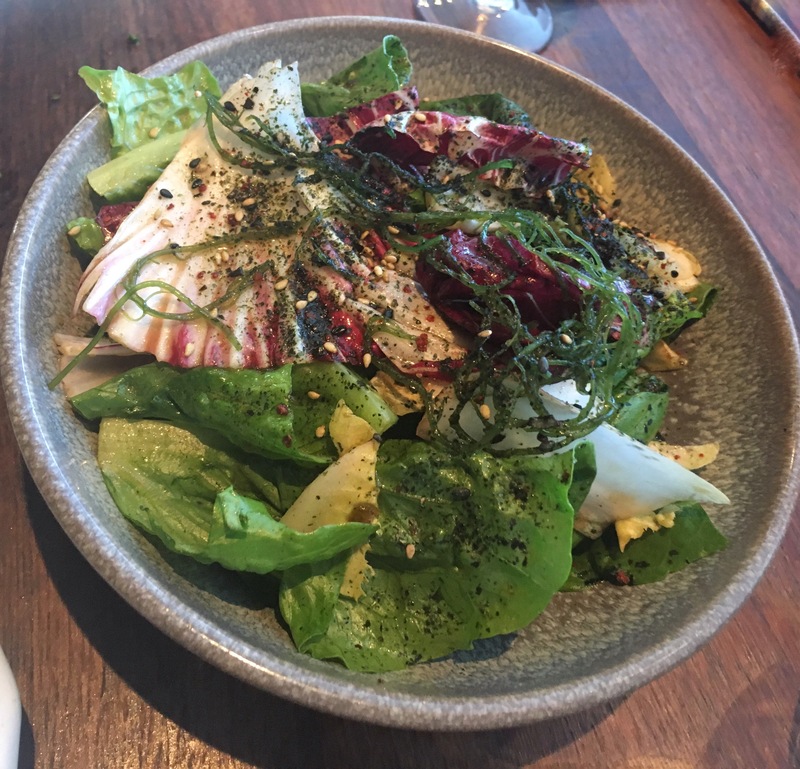 House salad topped up the vege intake, providing a refreshingly different taste sensation to the previous fish and beef dishes. Also an excellent cleanser before the Cape Grim short rib bo ssam which followed. Combing light, crispy and hot, this was an intriguing, very tasty treat! 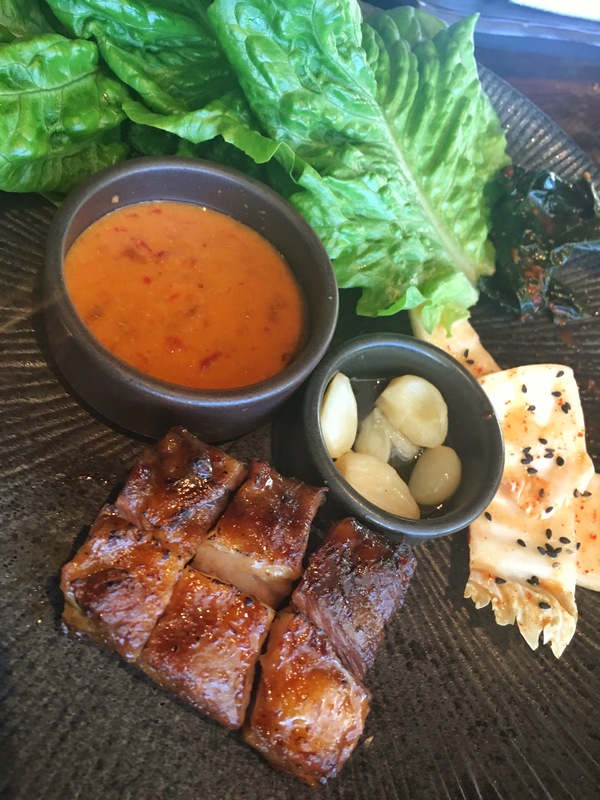 The pickles confit garlic and ssam sauce paired wonderfully well with the short rib. 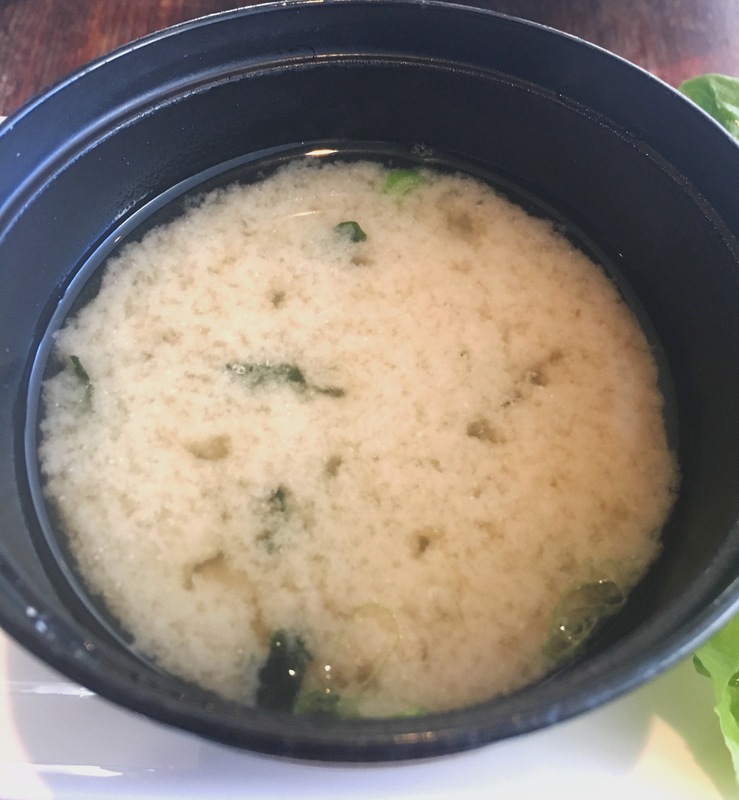 What better way to cleanse the palate before finishing with than with traditional miso soup. 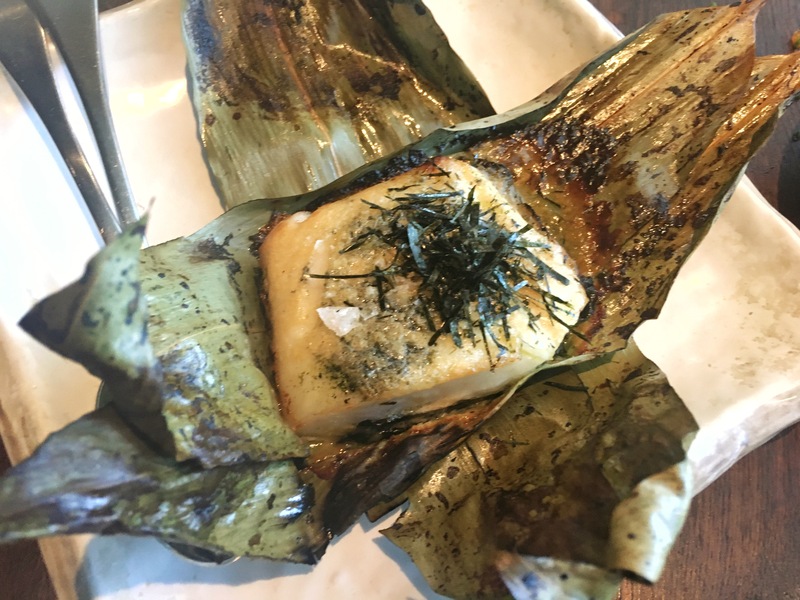 Tofu, spring onion and wakame filled this delightful miso was a sensational cleanser. Only one dish left to go on this set menu, the Chefs choice of dessert. Oh WOW! 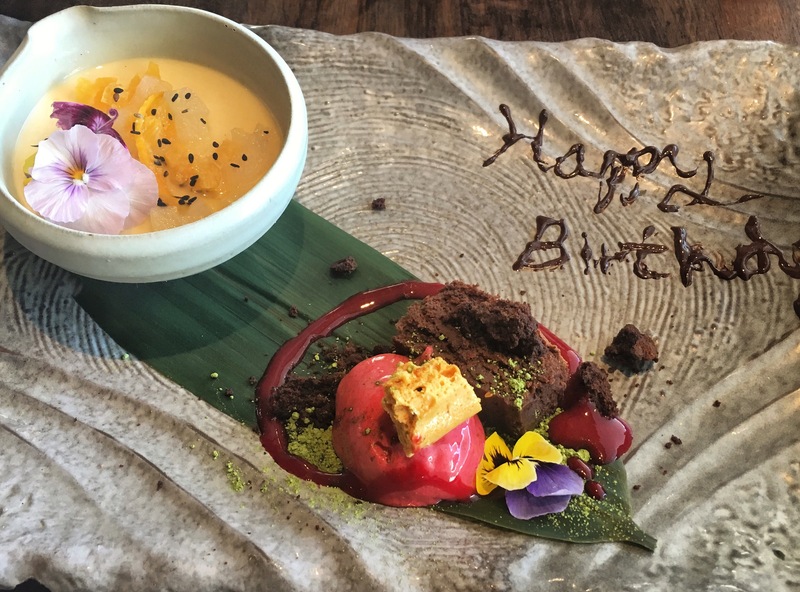 This colourful eye popping delight was a lovely surprise, added to which the combinations of desserts on the plate were enough to give you a sweet taste experience which finished off this meal beautifully. I cannot recommend this venue highly enough. Every now and then we do need to treat ourselves. This $98 per person sensational taste journey was worth every cent.